The iPad and Pharma. A perfect marriage? Pharmaceutical manufacturers face increasing pressure to refine their strategic and operational approach to sales and marketing. This need is motivated by a quickly changing industry landscape driven by healthcare reform (HCR) and an expanding web of strict government regulations. This includes gift ban laws, aggregate spend compliance/sunshine laws on both the state and the federal level, and diminishing physician availability because of HCR (i.e., 32 million new “covered” patients set to phase into the healthcare system). In the primary care setting, physicians typically give a pharma sales rep less than 30 seconds per interaction, most of which is time spent signing for samples. In specialty therapeutic areas, sales reps receive much longer periods of time but still struggle with their ability to differentiate themselves through clear, concise, and interactive messaging delivered to each physician. With all of this further complicated by gift ban laws and aggregate spend, which may eliminate a significant portion of lunch/dinner meetings and make all related spend information publicly visible, pharmas’ challenge to increase sales force effectiveness is becoming ever more real by the day. Generally speaking, companies typically identify a problem or a business process that needs enhancement and then perform due diligence and an in-depth technology assessment to choose IT to apply to that situation. Historically, this is what best practice would dictate. Well, say “hello” to the iPad, which is quickly turning this traditional wisdom on its head. While tablet PCs have been used in the field within pharma sales for quite some time to enable electronic signature capture and more interactive display of edetailing information, the explosion of next-generation tablet devices like the iPad has rocked the boat in this space. The pharmaceutical sales community is now undergoing an enormous shift, with widespread interest in transitioning toward HTML5-based tablet devices like the iPad, as the industry seeks a quicker, lighter, and more attractive way of displaying drug-related information. Two things in particular make this trend interesting: the purchasing behavior of companies regarding these devices and the monopolistic iPad mindset prevailing in this space. Despite conventional wisdom, several major pharmaceutical companies are putting the cart before the horse by purchasing iPads in large quantities prior to even owning a single application to run on the iPad. It is true that many existing Web-based SFA products delivered via a hosted or a SaaS model will run equally well in an iPad Web browser, but there is little incremental value over a traditional tablet PC with this scenario since no HTML5 capabilities are being utilized. Most SFA vendors servicing the pharmaceutical industry do have plans under way to launch an HTML5 version of their software, and a few already have, but these solutions are brand new and still immature. During recent conversations with large pharmas, I have heard leadership at several companies make comments similar in nature to “we have not yet purchased an iPad-based SFA software product, but we know we will eventually, so we’re buying the devices now.” More than one company has told us they have already purchased iPads in significant volume and are storing them for later use. Although it is true that many companies are indeed planning to make the shift toward these devices, the unwavering excitement and investment certainty displayed by the industry for a technology that still has no proven ROI in the pharma setting over existing tablet PC-based approaches are certainly interesting. I’m sure Billy Joel never expected his song to be used as a vehicle for explaining people’s love for the iPad, and while the general population probably still has greater affinity for New York than their iPad, that may not remain the case too much longer. Beyond pharmas’ overwhelming interest in embracing HTML5-based tablets, what makes the phenomenon even more interesting is that most pharmas with plans to adopt these devices are planning to purchase the iPad, with little current interest in seriously evaluating competing devices from other vendors. Based on interviews recently conducted with more than 20 pharmaceutical companies regarding CRM and SFA planned investment, all stated they believe Apple will remain the lead innovator in the space and that deploying SFA on the iPad (rather than a competing tablet device) is safer long term because it will help ensure they keep up with the latest technology developments and innovations. Only 3 of 20 companies mentioned they planned to spend any significant time reviewing competing solutions. Looking ahead, the verdict is that pharma is moving toward wide-scale deployment of HTML5-based tablet devices. Historically, Apple has had little presence in pharma, with the exception of iPhones in the ePRO space, but even that is a fairly recent development. With the skyrocketing adoption of iPads in pharma sales and marketing, Apple is now perfectly positioned to not only break into the sales and marketing side of the pharmaceutical industry but is likely to quickly become a dominant hardware vendor in the space. Enterprise 2.0: part 2 – the world around us has changed, forever. The following article is published through pharmaphorum and is the second in a series about Enterprise 2.0. The digital revolution has changed the world we live in. During the first wave of the revolution, back in the nineties, we gained access to an incredible amount of information. During the second wave, which started in the early 2000’s, we were able to add information ourselves – our experiences, opinions, thoughts, comments, ratings and reviews about products and services. Today, the digital revolution has become mobile, where we hold the internet in the palm of our hand with smart-phones and iPads. Many companies, especially B2C, jumped on the bandwagon of interactive communication, where they saw great opportunities for their marketing activities. But, as discussed in part one of this series, it’s more than just the additional marketing channel that makes the revolution. It has an impact on the way we are organised as a business, and this goes as deep as our blueprint, our DNA and our identity. This revolution is cultural. Looking more closely at the changes around us we can identify six trends. These trends reveal the need for companies to prepare themselves for a major change: to reorganise themselves from Enterprise 1.0 to Enterprise 2.0. Let’s take a closer look at these six trends. As a result of the digital revolution, the amount of information that we have to manage is increasing at an almost daily level. Information that frequently is difficult to find on our intranets. In addition, managing our email is a continuous struggle for many. Who doesn’t have a sort of love-hate relationship with their inbox? The amount of energy wasted within companies with data management is enormous. Although interactions costs (e.g. 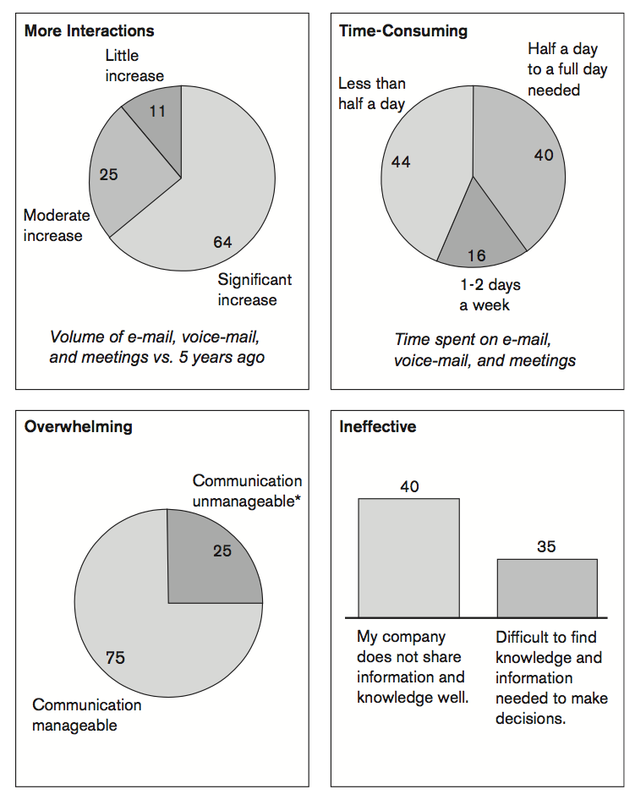 real life meetings) go down, the volume of interactions is headed towards infinity, leading to unproductive complexity, frustration within the workforce, increased bureaucracy and unmanageable communication (Fig 1, electronic survey McKinsey Quarterly 2005). *80% of those reporting “communication unmanageable” admit having difficulty fulfilling their key responsibilities. At home, we are used to fast internet connections, enabling us to upload, download and consume video, connect to our friends and family through social networks and talk real-time with each other via Skype. Coming to work, many of us still experience something different: websites such as YouTube and Facebook are blocked as non-productive sites, Flash videos cannot be viewed as the flash player cannot be installed and if you’re lucky to access online video, then frequently bandwidth is the limiting factor of a smooth experience. And that’s not all, the hardware available to the average workforce (computers, mobile phones) are very often seen as costly devices pressing on the annual budgets, rather than devices that improve people’s performance. Back home, the workforce emits sighs of relief, setting themselves behind their brand new and beloved iMac. More and more services are offered through ‘the Cloud’, which means that databases, file services, email and applications are available through external online servers. No software is required to be installed on the user’s computer, other than a web-browser. Examples of Cloud applications are Hotmail, Google Docs and Salesforce.com. Advantages of cloud computing are that the applications are accessible anywhere at anytime from any platform (desktop, laptop, smartphone) with the latest versions of the software available. Moving from the comfortable, ‘behind the firewall’ applications to cloud services that are out in the ‘big bad world’ is a tough choice to make for many organisations. Again, the loss of control is bothersome to them, while it may serve the employee’s productivity and in the end can lead to significant cost savings on license fees and service contracts. As a result of the digital revolution we can divide the current population into two generations: digital immigrants and digital natives. A digital native is someone who is born after the introduction of digital technologies, let’s say around 1980. A digital immigrant is someone born before the introduction of digital technology. The difference between these two groups is the way they adopt these technologies and integrate them in their lives. With the speed of technological developments increasing, more and more digital immigrants struggle keeping up, leading to conflicts between managers and supervisors (DI’s) and the younger workforce (DN’s). Social networking has surpassed email both in number of users and in time spent (Morgan Stanley, Internet Trends, June 2010). This means that people prefer social interaction through online networks over the rather one-dimensional and more impersonal email. But a Facebook group or a Twitter account is no guarantee for successful participation in the communities of your customers. To achieve that you need to do more. “You need to socialise”, according to Brian Solis, Principal at Futureworks and one of the prominent thought leaders in social media.“As a company or as a brand you need to participate in the conversations in such a manner that you’re not only of added value, but that you also involve your customers in your marketing and service activities.” Because of that social media will have an enormous impact in the organisational structure of a company. “Any division within an organisation that is effected by outside influence is going to have to socialise”. Eventually social media instruments will become as mainstream as email is today, but before that organisations will need to go through a process of cultural change. Modern society is in a process of becoming a network society. Through the internet we’re constantly connected and becoming less dependent on face to face communication. It’s as Jan van Dijk describes in his book The Network Society that the internet brings interpersonal, organisational and mass communication together. This means we’re moving from centrally and hierarchically organised companies (e.g. Sony, Microsoft, Shell) to true network organisations (e.g. Facebook, Google, Amazon). The main difference between the two extremes is that in the latter the user is more in control and wants to be involved and engaged. This is illustrated by the development in the music industry over the last decade. Music is booming, and artists and consumers have taken over control from big corporations. These six trends are disruptive to any industry, including pharma. These trends scare CEO’s and management teams. Losing control over their employees and the way they work gives them nightmares. But is that justified? Can we allow ourselves to perform ‘ostrich politics’ by sticking our heads in the sand, hoping it will all pass in a few years? Or is now the time to pick up the challenge and start redesigning our organisations? Most companies still have an organisational structure designed for the 20th century: hierarchical, directive, silo-structured and sales-driven (aka Enterprise 1.0). Especially in our ‘knowledge-intensive companies’ we need to mobilize the minds of our workforce in such way that we offer them freedom to do their jobs, give them access to information, provide them with a network that enables them to connect with peers and the likeminded and stimulate collaboration and co-creation (aka Enterprise 2.0). Not only will such company create an environment that motivates people and retains talent, it also will lead to an increase in net income per employee. So the challenge is the organisational redesign of our companies. 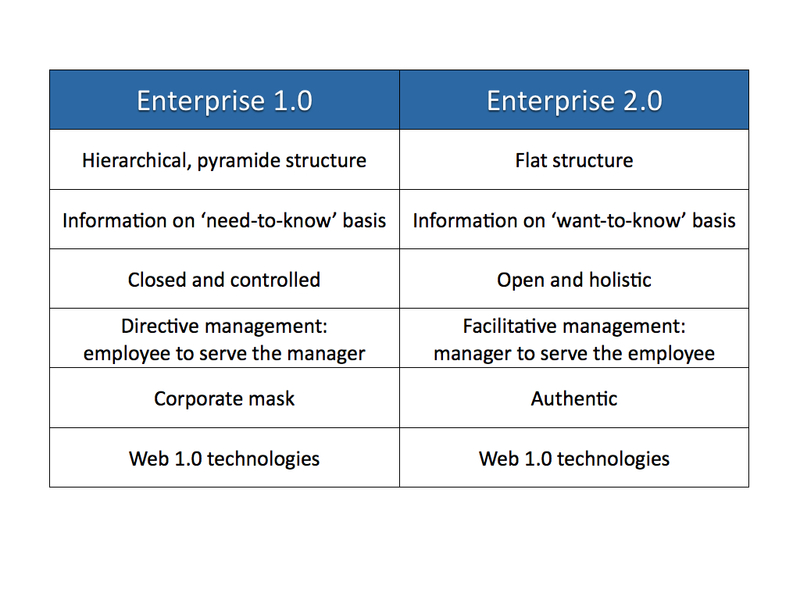 Moving from Enterprise 1.0 to Enterprise 2.0. The key is the employee. Because, as with the music artist and the music lover, that’s where the power is. Create an environment where your employees can excel, where they feel empowered and acknowledged. Give them autonomy to reach (and surpass) their goals, allow them to master their skills and give purpose to what they do. With that you’ll give your workforce the drive to get up in the morning and go to work, motivated. What do you think is key to establishing Enterprise 2.0? The Afya Serengeti campaign, of which we reported earlier in our blog, has won an Award of Excellence in the category Animal Health. With this award, founded by the RX club, the campaign is honoured for its creativity and execution. The campaign was developed by Circa Healthcare in order of Intervet/Schering-Plough Animal Health, and focuses at the prevention of rabies in the Serengeti area in Tanzania. The campaign supports vaccination teams that vaccinate all domestic dogs in the communities surrounding the Serengeti National Park. We were involved in this campaign through the production of a video-series where we followed these team in their year around vaccination campaign. 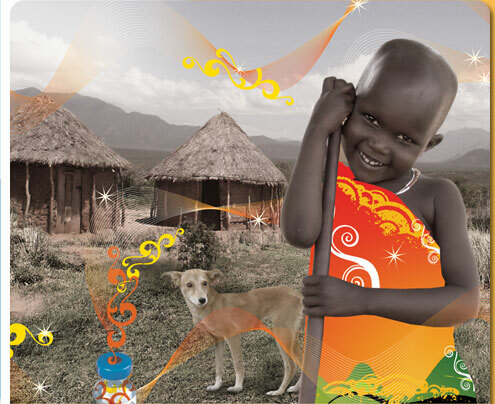 Rabies is a lethal disease that still claims more than 25,000 Africans per year, mainly children. While rabies is preventable with vaccination, fighting it is a huge undertaking. The Afya Serengeti project alone encompasses an area inhabited by more than 6 million people and 500,000 domestic dogs. This Award of Excellence is a fantastic recognition for this sympathetic campaign. We thought, let’s do things different. And so we did. During our presentation at DigiPharm 2009 we used our slot to interact with the audience. After 1,5 day of talking about the (im)possibilities of Social Media for Pharma, sharing Best practices, visions of the future and panel discussions we thought that it was time to measure the opinion of the participants. Because, as James Heywood (patientslikeme) said on day one: “The pharma industry is the only health care stakeholder that really cares, because they measure”. OK, we thought, if that’s the case, let’s measure. Or, in our own words, let’s opinionate. Before our exercise started, every participant was given a green and a red voting card (an analogue voting system symbolizing pharma’s current position in the evolutionary ladder of Social Media). We presented 4 statements. For each statement we gave a pro and contra argument after which the audience entered the discussion, giving their support to either of the two positions. Finally, the discussion on each statement was closed by a vote. Those who agreed raised the green card, those who disagreed the red. Interesting results. In our following blog-posts we will elaborate more on each of these statements. We will share some of the responses from the audience and will give our own opinion. We would like to thank all the delegates of DigiPharm for their co-operation in this ‘ad-hoc research’. Stay tuned, there’s more to come.